Niels Albert (BEL) – the defending World Champion came to the US directly from the Netherlands two weeks ago. His first race on US soil netted him a victory and helped cement him as a favorite for a repeat in Louisville. The first half of his season saw Albert struggle to win, and sometimes podium. Since mid-December, Albert has become a real threat and is often the man to beat. If his win in Cincinnati is a sign, Albert could be wearing the rainbow jersey for another year. Sven Nys (BEL) – the “Cannibal from Baal,” is the greatest cyclocross rider of the past decade, and perhaps, the greatest ever. Nys has won everything there is to win in the sport of cross and has won them multiple times. In fact, he’s probably won more races than many riders have actually raced. However, when you look at his palmares (it’s going to take a while), you’ll notice one thing; he’s only won one World Championship. Nys started out his season in true Nys fashion, crushing the competition week in and week out. After suffering from bronchitis in late December, Nys has struggled a bit. If he can find that mid-season form, he’ll be unstoppable on Sunday. Lars van der Haar (NED) – after winning a second straight U23 title, van der “Go Haarder” petitioned the UCI to allow him to race with the elites this year. While he hasn’t been able to pull off the big victory, he’s always in the mix and is a constant podium threat. If he can use his incredibly fast start to get a head of the Belgians, and hang on to their attacks, he could find himself in a position to win. Van der Haar has the fastest sprint in the field, so if he comes into the final lap with the leaders, look for him to unleash hell in the final few hundred meters. 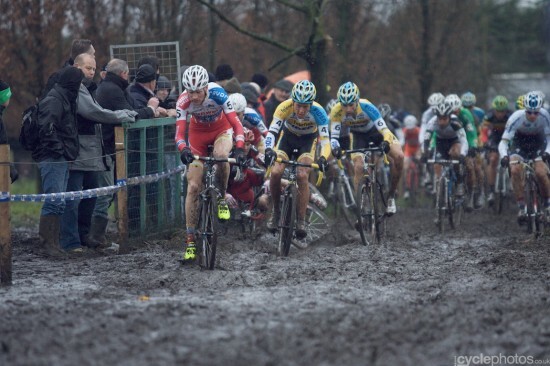 Kevin Pauwels (BEL) – Pauwels has an opportunity to make history on Sunday. Pauwels has won a junior and U23 world title and would be the first rider to win one in all three categories. After winning the first World Cup, Pauwels seemed to lose form and struggled to podium. However, during “Holy Week,” he turned things around, winning a World Cup round and several other races. Since then, he’s won a few more World Cups and looks poised to make a bid for victory on Sunday. JP (USA) – the two JPs (Jonathan Page and Jeremy Powers) will be looking to pull of the upset on Sunday. Page knows what it is like and what it takes to podium at Worlds (he finished second in 2007). Page’s season started out slow, but he has turned it on lately, including winning a fourth national championship a few weeks ago. If he can keep that form, combined with some good luck, we could see a 2007 repeat. Powers’ season has been the opposite of Page’s. He started out incredibly well with multiple victories and a top ten at the first World Cup. Since then, his season has tailed off a bit and he hasn’t seen the front end of a race in while. However, if last weekend’s third place (behind Albert and Wieste Bosmans) is any sign, Powers could have refound his form just in time. This entry was posted in Races and tagged Cyclocross, elite men, jeremy powers, joathan page, kevin pauwels, lars van der haar, louisville 2013, niels albert, sven nys, world championships. Bookmark the permalink. My dark horses are Klaas Vantornout and Rob Peeters. Both are constant lurkers who can grab podiums here and there, and Klaas has had two big wins this season. I’ve got my doubts that Nys can translate his early-season dominance into crushing victories later in the season, especially big wins. He races so much and comes into the season so hot, whereas so many other riders take a steadier build. But he’s definitely the sentimental favorite. I think the safe money is on Niels Albert.